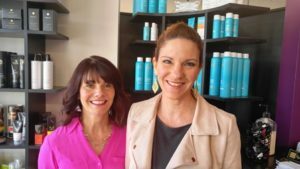 Westborough – Gloria Raneri (l) and Gayle Eldridge, the co-owners of Hair We Are, will be hosting a grand opening celebration at their shop, located at 57 East Main St., Westborough, Thursday, May 5 at 4 p.m. The event will feature giveaways, raffles, refreshments, and more. For more information or to book an appointment call 508-366-2036 or do so online at www.hairweare.net. Next articleDare I say “Welcome Spring”?